Join the discussion on our forums! 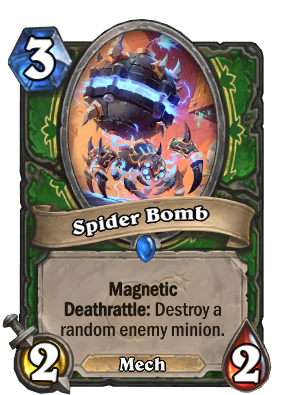 Come discuss Spider Bomb over in our dedicated Spider Bomb discussion topic. Magnetize this to a Rusty Recycler. Ooooh, what a pretty golden animation! This card is actually insane guys. with the right set up it's like vilespine slayer in death rattle hunter. Don't even think about the mech tag focus on the deathrattle. the deathrattle goes off when it magnetises right? no, that' would be pretty op. It passes the effect to the new mech. Sounds pretty fun. Removal for hunters might push the class into control archetype even more that now. I would like that. You can now trigger the deathrattle effect with so many hunter tools, such as Play Dead and Terrorscale Stalker. Definitely an insane tempo card in both early and late game . Hooray! Now when Deadly Shot misses the minion I wanted to kill I can just try again. Very cool. This seems really good, there is deathrattle synergy, if hunter gets mech synergy... maybe we will finally get control hunter? We will need some healing, more card draw and early game control, but there is hope. At least I have hope. I see 3/7 framebots with deathrattle on turn 3... meta defining. It's a spider. It's a bomb. Well, any Shadowverse player can tell this low costing 'destroy a random enemy minion' deathrattle effect minion is gonna be monstrous in both such a deck and even a more unique refueling aggro deck. All we need now is a cheap 'destroy a friendly minion and draw X cards' spell or minion for hunter and those two variants will just skyrocket. You win some, you lose some. I commend you for trying though.